Kids can produce instant poetry, inspired by these partially-written haiku. Composed by Allan Wolf, author of Immersed in Verse, they range from silly to serious, realistic to fantastic. 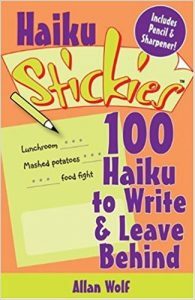 Each poem has blank spaces for children to fill in; earlier in the pad, they’ll need to add only a word or two, while the later haiku will have kids writing nearly from scratch.